Applying herbicides at the proper rate is essential to achieving satisfactory pest control. The directions on the container label tell which application rates give the best results. The applicator’s job is to apply the amount recommended on the label. One way to achieve this is to make sure the sprayer is in good condition, set up properly, works well and is calibrated correctly. For information on calibrating a sprayer, see FABE-520 and FABE-529 which describe two different calibration procedures. Use the following link to reach these publications, and search using the publication numbers given above: ohioline.osu.edu/findafactsheet. Although your sprayer may be in top shape, and you may have calibrated the sprayer frequently, you could still end up with a less than satisfactory pest control if the correct amount of chemical was not put into the tank. Labels give two types of application rates: volume of spray mixture (pesticide and water) applied per unit area (gallons per acre, ounces per 1,000 square feet, etc. ), and the amount of actual chemical applied per unit area (ounces, pints, or quarts per acre or 1,000 square feet). The first requirement can be attained by proper calibration and operation of the sprayer. The second label recommendation not only requires proper calibration and operation of the sprayer, but it also requires that the spray mixture contains the right concentration of the actual product applied. The amount of chemical needed per tankful depends on the recommended rate and the size of area you intend to treat per tank of spray. Calculations and concepts are the same whether you are using a manual backpack sprayer with a 5-gallon tank, a lawn mower/ATV sprayer with a 15-gallon tank, a pull-type sprayer with a 500-gallon tank, or a 1,500-gallon self-propelled sprayer. The only difference is in units. For small sprayers, the rate may be expressed in ounces, quarts, or gallons per 1,000 feet. For boom sprayers, the application rate is usually given in gallons per acre (GPA). Therefore, make sure you use the proper units and/or conversions in your tank mix calculations. Let’s assume now that you have a boom sprayer. Follow these steps to determine the amount of herbicide that needs to be added to a full tank of water. Keep in mind that “acres sprayed” in the equation above is the acres driven over (includes any overlap). For broadcast spraying situations, “acres sprayed” is the same as the acres driven over. 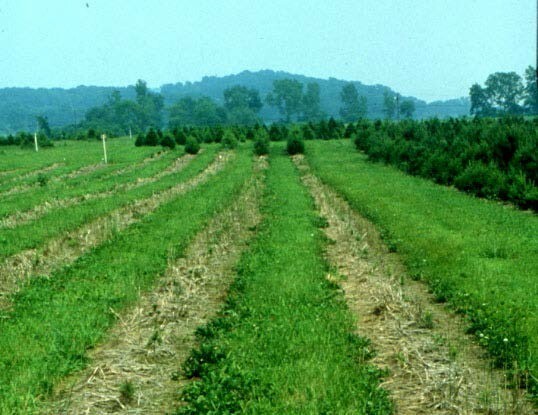 However, for applying chemicals in a narrow band, such as treating the area where small seedlings are planted in a narrow band as shown in the Figure 1 below, the “acres sprayed” does not include the untreated area between rows that are sprayed. Only a fraction (the band) of each acre is actually treated. For that reason, we will refer to the acreage actually sprayed as “treated acre” to differentiate it from “field acre” that includes both treated and untreated areas. This somewhat confusing concept is explained in more detail later in the fact sheet with an example situation for band spraying. 2. Determine the amount of herbicide to add to full tank. To find the amount of pesticide needed per tank, multiply the amount of actual chemical to be applied per acre by the number of acres treated per tank (Step 1 above). The final mix consists of 40 pints (5 gallons) of pesticide formulation and 295 gallons of water per 300 gallons of tankful. NOTE: If a full tank is not needed to cover an area, follow the same calculations above, except, instead of using full tank capacity, use the amount of water needed to cover that area. Similarly, if the tank is not completely empty when refilling, instead of using full tank capacity use the amount of water required to refill the tank. For example: If you have a 300-gallon tank but you have 75 gallons of spray left in it, when you refill the tank, you will use 225 gallons in your calculations instead of the total tank capacity. You must add 30 pints of chemical to the tank after refilling it with 225 gallons of water. Sometimes, chemical manufacturers provide recommended rates in terms of active ingredient (A.I.) to be used per acre rather than the amount of total product per acre. In these cases, calculate the amount of material to be applied as shown in examples 2 and 3 for dry chemicals and liquid chemicals, respectively. The chemical you are using is liquid. The recommendation calls for 1 pound A.I. per acre. You have purchased a formulation that contains 4 pounds A.I. per gallon. Determine the amount of product needed per tankful. First, determine how much chemical and water will be used per “field acre” when applied only on 12-inch bands (remember, the rate per field acre when banding pesticides should be less than when the whole field is treated as a broadcast application—see illustration below). The rest of the procedure to determine the chemical required per tank is the same as explained earlier for broadcast applications. Thus, you will need to add 60 pounds of chemical product to the 300-gallon tank, and this mixture should cover 60 field acres. 3. How to calculate mixture when a full tank is not needed. A two-step calculation is required to determine the amount of water and herbicide needed to spray smaller fields that do not require a full tank. 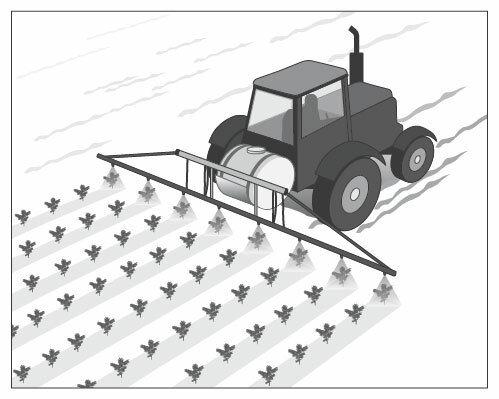 Step A: Determine what proportion the size of the actual field to be sprayed is of the field that can be sprayed with a full tank. Step B: Reduce both the amount of water and the amount of herbicide to the proportion calculated in Step A above. Amount of water needed = (300 gal.) x (0.25) = 75 gal. Amount of herbicide needed = (60 lbs.) x (0.25) = 15 lbs. 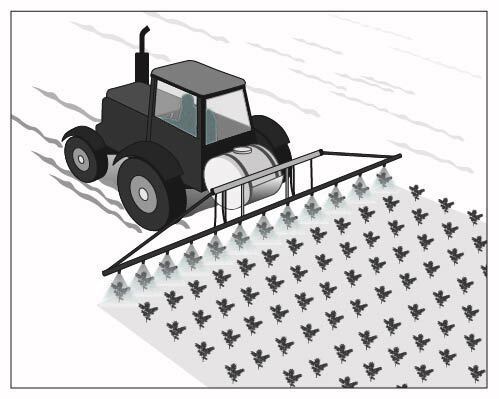 Thus, you will need to add 75 gallons of water and 15 pounds of chemical product to apply the mixture on 12-inch bands over 36-inch rows over 15 acres. When adding herbicides to a sprayer, it is convenient to use either a container that holds exactly the desired amount of herbicide, determine the number of teaspoons or tablespoons equal to the desired amount, or mark on a larger container exactly how full it should be to contain the desired amount of herbicide. When measuring herbicides initially, be sure to use liquid measurements for liquid materials (e.g., liquid ounces in a measuring cup) and dry measurements for powders and other dry formulations (e.g., weight in ounces). Use Table 1 to determine equivalent measures and conversions. Adding the right amount of chemical in the tank is very important, however, what is equally important is maintaining the uniformity of active ingredient in the spray tank mixture. Incomplete mixing results in varied application rates. This is a bigger concern when using dry products, such as wettable powders rather than liquid products. When added into the sprayer tank, some dry chemicals may either float on the surface a long time, or settle to the bottom of the tank. Either way, the result will be a non-uniform discharge of chemicals from the sprayers throughout the spraying period. Therefore, when using wettable powders, make a slurry in a separate container and then add the slurry to the tank to ensure good mixing. Rinse the containers three times, and pour the rinsate into the tank before finishing the fill. Dispose of the containers properly, as recommended on the chemical label. Always keep safety in your mind when working with chemicals, especially pesticides. Always try to minimize oral, dermal, or inhalation exposure to chemicals. Wear protective clothing when mixing chemicals, during spraying, and when calibrating and cleaning equipment. Goggles, rubber gloves, and respirators or masks are standard equipment when handling pesticides. Review the sprayer operator's manual and chemical labels for recommended procedures regarding safe use of equipment and chemicals. The author thanks Drs. John Fulton and Dewey Mann, Department of Food, Agricultural and Biological Engineering, The Ohio State University; Kathy Smith, Forestry Program Director, Ohio State University Extension; and Mary Griffith, Agriculture and Natural Resources Extension Educator, Ohio State University Extension, for reviewing this publication and for their editorial contributions.